Training and multipurpose training centre. The department works with other departments at Chikankata Mission Hospital, the local community, government departments and other external stakeholders. The HIV AIDS Response Department endeavours to carry out the premier Christian programme for AIDS related community and training services in Zambia. The HIV AIDS Response Department is guided by the following values in its effort to execute various HIV/AIDS related services to the local and outside community. Respect for the rights of clients, the local and external stakeholders. HARD is operating on the following objectives in order to realize the set objectives. To reduce the further spread of HIV through community participation. To build the capacity of various stakeholders through orientation, technical support and training. To enhance the community economic capacity for mitigation of the impact of HIV/AIDS. To promote worker’s access to HIV/AIDS related services. Under this department, Chikankata Mission Hospital has had funding relationships with CIDA Canada, CIDA Sweden, AUSAID, UNICEF, PEPFAR, SAWSO, European Union and many other well wishers. At present, the department is working in partnership with KNH, CHAZ/Global Fund, AHF, HOPE HIV and RATN. We are grateful to all our partners, both past and present for their kind generosity and all that we have achieved together. The Counselling Unit promotes community engagement at individual, family and group level with the aim of helping to respond to issues of HIV prevention, care and support. The unit provides pre and post test counselling in the hospital to help people make choices to test for HIV which is key to HIV prevention and linkage to care and support at both institutional and community level. At community level the unit utilizes Community Capacity Enhancement through Community Conversation (CCE) approach for engaging with varying categories of members of the community such as men, women, youths, children, headmen and the general population to encourage them to reflect, share experiences and make choices for their life. This unit makes efforts to ensure that the community prevents the further spread of HIV at community level by ensuring that the Care and Prevention Teams (CPTs) are empowered to carry out various HIV prevention interventions such as community sensitizations aimed at helping members of the community to adopt behaviour that does not risk HIV infection. The OVC unit exists to promote a community response to the management of the OVC situation. At present, the department through this unit has registered 5771 OVC who are being reached. To achieve the overall goal, the unit is working through community structures including OVC committees and an OVC board whose member ship is made up of 400 volunteers. The key activities include: enhancement mobilization meetings, refresher trainings, quarterly OVC board meeting, CPT/OVC collaboration meetings, OVC tournaments, knowledge reinforcement meetings for headmen, leadership skills training for the OVC board, internal and external exchange visits, child participation forum, stakeholders meetings and commemoration of important days such as World AIDS day, Youth Day, Day of the African Child and World VCT Day. In addition, the unit executes entrepreneurship skills training for OVC committees and OVC households, economic empowerment to guardians and OVC, issue based PSS meetings for guardians, OVC parenting skills training for guardians, OVC skills camp, inter community athletics for OVC, child counselling training skills for OVC committee members, radio programmes, partners’ meetings and paralegal skills trainings for OVC committee members. Other activities are technical support visits to programme sites, supervisory visits, review meetings, occasional provision of working kits to OVC committees such as T. shirts and bicycles to OVC committees and other stakeholders within the project sites as a way of supplementing the community effort. For example, the unit has partnered with the community to put up a 2 x 2 classroom and teachers house at Lwaala Community School. Through this unit the HIV AIDS Response Department ensures that the needs of PLWHA, the aged, disabled, mentally challenged clients at community level are met. This is done through Care and Prevention Teams (CPTs) which are multidisciplinary groups of volunteers chosen by the community to offer services to members of the community without any pay. Basic needs of clients are met using locally mobilized resources. The CPTS visit clients in their respective home, offers psychosocial support to them, they ensure that those clients who are on ART and other forms of treatment take their medicine according to instructions. The CPTs also support families of these clients in many ways so that they are able to look after their sick relatives better. As well as patient tracking, adherence counselling and data management. Chikankata Mission Hospital through the HARD department has been conducting HIV/AIDS related short courses to local, regional and international participants since 1989. 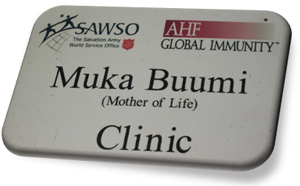 So far over 5000 people have been trained in various HIV/AIDS management related skills. The courses that are on offer are Community Care of HIV/AIDS ToT, Children and Their Carers ToT, Psychosocial Counselling and Child Counselling. Chikankata Mission Hospital has partnered with the Regional AIDS Training Network (RATN) in delivering children and their Carers and Community Care of HIV/AIDS Courses while the other two are executed using participants’ contributions. The department also runs a multi – purpose training centre on behalf of Chikankata Mission Hospital which generates resources to supplement other sources of income and various institutional activities such as buying extra drugs, paying electricity bills, buying fuel among others. We do rent out these faccilities and the centre has accommodation, conference and dining facilities at an affordable cost. For further information please contact chikankata.hospital@gmail.com.